US-based Fabrizia Spirits, a craft producer of all-natural citrus spirits, has imported a custom-built lemon-peeling machine from Pompei, Italy, to best meet consumer demand for its all-natural limoncello. The machine is the first of its kind to be used in the US and enables Fabrizia to increase beverage production and maintain a superior level of quality. In autumn 2015, brothers and co-owners Phil and Nick Mastroianni travelled to Italy to purchase a lemon-peeling machine to aid in expansion. Prior to the purchase, Fabrizia peeled all lemons used to make its limoncello by hand, totaling 155,000 lemons in 2015 alone. The new machine streamlines that time-intensive process and is capable of extracting the zest of 2,400 lemons with minimal pith every hour. Previously, it took the Fabrizia team an entire day to peel that equivalent number of lemons. Once the zest is peeled, the remainder of the fruit is juiced on site to make lemonade for Fabrizia’s Italian margarita, a ready-to-serve cocktail. What part does packaging play in reducing food waste? The World Food Innovation Awards once again hosted a wonderful array of products in the best new food concept category – all revolutionising their respective segments of the food and beverage industry, from snacking to ingredients and convenience food. Offering a truly groundbreaking option that challenges long-established culinary traditions in the UK, Crobar by Gathr stands out with its natural dairy- and gluten-free energy bar that contains cricket flour. As an alternative protein source, crickets emit 80 times less CO2 than cattle, use ten times less space and a lot less water, while containing as high a protein content as beef but lower in fat. Cereal Lovers also taps into the ever-expanding healthy, on-the-go food trend of recent years with its Crunchtime Nuggets. This convenient snacking option uniquely bakes all of its ingredients together, making digestion easier and healthier, offered in resealable pouches that double as a mobile cereal bowl and can be eaten dry or with milk or juice. On the dairy front, V&H’s Little Moons brings a new concept to the ice cream category with scoops of gelato wrapped in mochi, which is made by steaming and pounding sticky rice flour until it gains a soft and delicate elasticity. Mochi not only brings taste and texture to gelato, but also allows the ice cream – free from gluten and artificial colours, flavours and additives – to be eaten by hand. Mexicana Hot Shots from Norseland, on the other hand, snackifies another dairy favourite, cheese, by offering spicy cubes of cheddar wrapped up in a ready-to-go packaging. Flavoured to perfection with a blend of bell peppers and hot chilli spices, each cube promises the same punch as the last with a unique spicy flavouring consistent throughout the cheese. Simply Saffron of Ethical Blends is made by using a unique low energy process that ensures the actual spice is encapsulated in an additive- and preservative-free, ethically sourced saffron paste, offering a completely new way of consuming saffron. The ingredient is available in jars and single-dose Easysnap sachets, which makes it possible to add the saffron in seconds to recipes in a pre-measured portion, removing the risk of overdosing. Another innovation in the ingredients shelf is FortiSalt, which provides a full, rich and salty gourmet flavour but with 50% less sodium than regular salt. Furthermore, FortiSalt combines nutritionally balanced essential minerals and trace element salts, such as magnesium and potassium that help our bodies to better balance and utilise sodium. For those looking for a visually enticing pasta experience, Le Violetta from Surgital offers a revolutionary ravioli with a purple filling, which is made mainly from the small, sweet and soft-textured violette potatoes, rich in antioxidants and anthocyanins that give them their vivid colour. Making the world kitchen classics accessible for all, the Versatile Mini Koftes from Snowbird Foods offers a convenient solution for fans of authetnic Middle Eastern flavours, with a delicate heat that has found favour with older children as well as adults, while Foodie Fusions’ Green Gram Pudding brings a traditional Indian taste to the world stage. A traditional recipe with the delightful aroma of clarified butter, the pudding serves as the ideal end to any meal. As a professional recipe developer, I spend a lot of time in the kitchen. In fact, I often call myself a “professional dishwasher,” and though it’s a joke, it’s not too far off. Despite these credentials, when I tell people that a kitchen scale is one of the useful, helpful tools you can own for cooking and baking, I’m often greeted with skepticism. 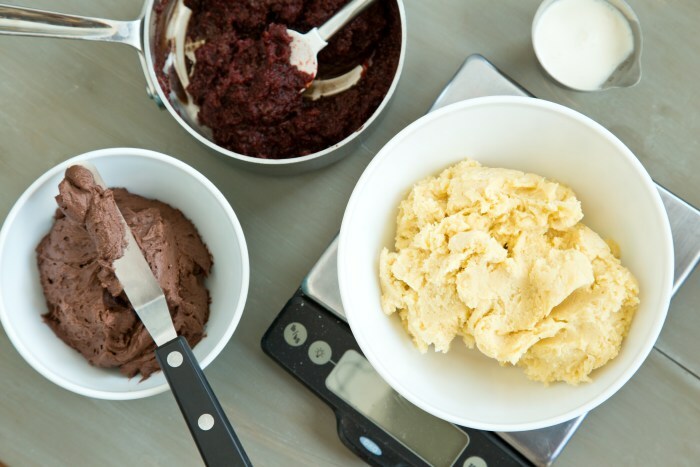 It sounds like something too finicky or controlling for the everyday cook—sure, maybe it’s something a professional pastry chef would use, but isn’t it easier just to grab a set of nested measuring cups? No way! A kitchen scale is a must-have for anyone who wants to be a better, happier, healthier cook. It’s a game-changer in two ways: first, a scale’s accuracy makes it a 100 percent guaranteed approach to keep your portion sizes under control. Second, it’s an all-around champion at making your prep work and ingredient measuring more efficient. Accuracy and efficiency? Two of the sweetest sounding words in my book. Even as a professional cook, I have always found portion control one of the hardest things to, well, control and to wrap my head around. I’m frankly terrible at eyeballing a single serving of pasta and figuring out how much of a block of cheese constitutes 1 ounce. Trying to estimate these portions did me no favors and all that excess just piled up around my waistline. But with a kitchen scale, it’s easy to see exactly how much I am eating and how much I should be scarfing down. A half cup of almonds (2 1/2 ounces) might sound like a sensible snack portion for the day, but when you realize you’ve been eating an entire cup of almonds in one fell swoop, it’s a big eye-opener. Never again! And then there’s the help it provides with prep and measuring—even better than a second set of hands. Whether or not you own a dishwasher, I’m sure you’ll agree that the pile of dishes left in the sink after cooking is no one’s favorite part of the meal. But by using a kitchen scale, you can cut that pile down considerably. Instead of chopping onions, then piling them them in a 1-cup measuring cup, then scraping them out and adding them to a mixing bowl or casserole, wouldn’t you rather just chop a 6-ounce onion and add it directly to your bowl? For an even more visually compelling example of how much time and dish-washing you’ll save with a scale, I’ve prepared this tasty beet-chocolate cupcake recipe measuring by both weight and volume. 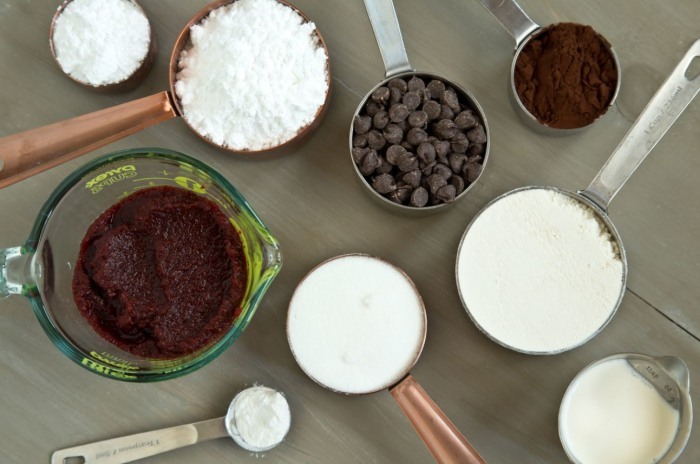 Measuring all the ingredients—from pureed beets to chocolate chips to cocoa powder—by volume leaves you with a mess of measuring cups. But if you measure by weight, you’ll only need 3 bowls: one for the melted chocolate, one for the cupcake batter, and one for the frosting. That’s a huge difference! Researchers from the University of Cincinnati (UC) have found that eating or drinking sweets may decrease the production of the stress-related hormone glucocorticoid–which has been linked to obesity and decreased immune response. “Glucocorticoids are produced when psychological or physical stressors activate a part of the brain called the ‘stress axis,'” said Yvonne Ulrich-Lai, PhD, a postdoctoral fellow in the department of psychiatry. “These hormones help an individual survive and recover from stress, but have been linked to increased abdominal obesity and decreased immune function when produced in large amounts. The laboratory findings were presented during a poster session Tuesday, Nov. 15, at the annual Society for Neuroscience meeting in Washington, D.C.
Dr. Ulrich-Lai and a team of researchers from the department of psychiatry showed that when laboratory rats chose to eat or drink sweet snacks their bodies produced lower levels of glucocorticoid. She said that sweets–especially those made from sugar, not artificial sweetener–might do the trick. Psychological stress could involve things such as public speaking, being threatened, or coping with the death of a loved one. Examples of physical stress are injury, illness, or prolonged exposure to cold. During the study, researchers gave adult male rats free access to food and water and also offered them a small amount of sugar drink, artificially sweetened drink, or water twice a day. After two weeks, the rats were given a physical and psychological stress challenge. Following both types of stress, rats that had consumed the sugar drink had lower glucocorticoid levels than those that drank the water. Those drinking the artificially sweetened drink showed only slightly reduced glucocorticoid levels. Dr. Ulrich-Lai noted that although her team was not studying the health effects of the sweetened drinks, they did not notice a body-weight increase in the rats consuming the sugar drinks. James Herman, PhD, co-author, professor and stress neurobiologist in the department of psychiatry, said the next step will be to determine how these sweetened drinks are decreasing glucocorticoid production. “We need to find out if there are certain parts of the brain that control the response to stress, then determine if the function of these brain regions are changed by sugar snacking,” he said. Co-authors also included Dennis Choi and Michelle Ostrander, PhD, both of UC’s psychiatry department.